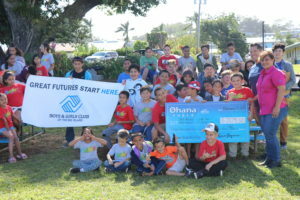 From left: HFN Commercial Marketing Representative Joy Madriaga presents check from “Fuel Up. Do Good.” community grant to Family Programs Hawaii staff Cherica Jackson, Suzanne Sarlund, Keith Kuboyama, Paulette Bethel, Jennifer Carter, Cindy Bryant and Melissa Harmeling. Also pictured: Kimo Haynes, president of Hawaii Petroleum, Inc. (second from left) and Lloyd Leong, general manager of Hawaii Petroleum, Inc. (fourth from right). 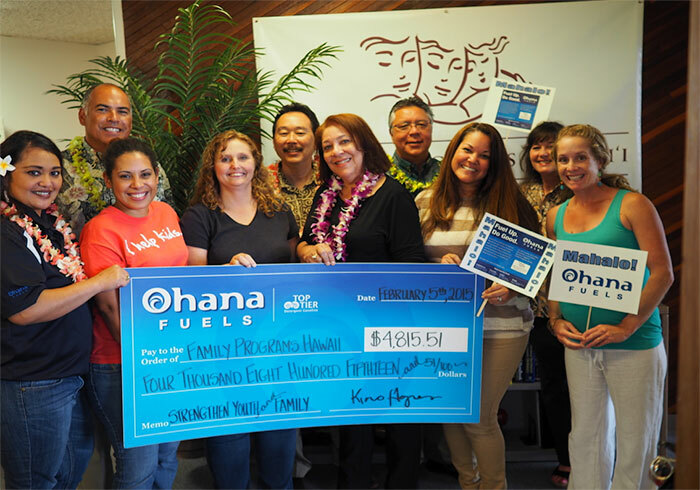 Hilo, HI (Feb. 18, 2015) — A firm believer in helping our local community thrive, Ohana Fuels recently donated $4,815.51 to Family Programs Hawaii through its “Fuel Up. Do Good.” community giving program. 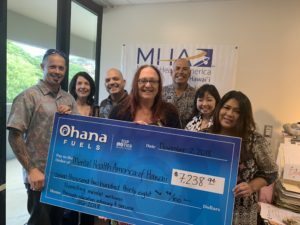 Contributions provided by Ohana Fuels will be used to support Hawaii Family Programs’ Project Visitation, a program that utilizes community volunteers to facilitate monthly visits for siblings who have been separated through the foster care system so they can stay connected. Family Programs Hawaii is a non-profit agency dedicated to serving children and families involved in the foster care system. Project Visitation, introduced to East Hawaii two years ago, has been making a significant impact on the lives of foster siblings placed in different homes by helping them maintain relationships through visits. 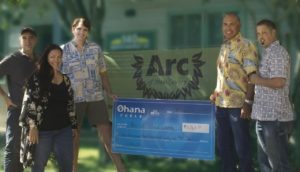 Ohana Fuels has four locations on Hawaii Island and eight on Maui. Ohana Fuels gasoline has been certified as TOP TIER™ to meet the premier standard of gasoline for optimum performance and fuel efficiency recognized by six of the world’s top automakers: BMW, General Motors, Honda, Toyota, Volkswagen and Audi. TOP TIER™ additives help clean your engine; optimize fuel economy; eliminate hesitation, stalling and rough idling; restore optimum performance; and reduce emissions.